Carcinoma of the temporal bone is rare, accounting for fewer than 0.2% of all tumors of the head and neck. Only 200 new cases of temporal bone cancer may be diagnosed each year across the United States. This number includes cancers arising from skin of the pinna that spread to the temporal bone; primary tumors of the external auditory canal (EAC), middle ear, mastoid, or petrous apex; and metastatic lesions to the temporal bone. Axial image that shows the spread of temporal bone cancer. Malignancies of the temporal bone arise most commonly from the pinna and lateral concha because these sites are likely to have undergone many years of sun exposure. In these areas, basal cell carcinoma and squamous cell carcinoma are most common. [1, 2] If neglected, these tumors may spread medially to the EAC. The most common type of primary cancer in the EAC is squamous cell carcinoma, and squamous cell carcinoma of the temporal bone may originate from the EAC or middle ear where chronic otorrhea and inflammation, cholesteatoma, or both may be associated risk factors. Since temporal bone cancer is so rare, measuring specific etiologic factors for cancers in this area is very difficult. However, fair-skinned whites are more prone to nonmelanomatous skin cancers in other areas, especially areas exposed to ultraviolet radiation. A genetic predisposition to skin cancer may also exist, manifested as the development of skin cancers in sites not exposed to sunlight as well as sun-exposed areas. Chronic otitis media and cholesteatoma are common in patients with temporal bone cancers and have been implicated as etiologic factors. [4, 5] Chronic suppurative otitis media and the resulting chronic inflammation may lead to squamous metaplasia. Human papillomavirus has been implicated in squamous cell carcinomas of the middle ear. Lim et al (2000) reported a series of temporal bone cancers in 7 patients who had undergone radiotherapy for nasopharyngeal carcinoma. These patients had a particularly poor outcome. The complex anatomy of the temporal bone makes tumor spread difficult to predict. Tumors of the skin around the auricle may extend along the soft tissues of the neck and ear. The soft tissues are a poor barrier against tumor spread, and eventually the tumors may extend along the conchal bowl and into the EAC. The cartilage of the EAC provides minimal resistance to tumor spread. The fissures of Santorini, foramen of Huschke, and bony-cartilaginous junctions are a source of direct access to the periparotid tissues and temporomandibular joint. Cancer in the external auditory meatus can invade posteriorly through the soft tissue into the retroauricular sulcus over the mastoid cortex. The bony canal is more resistant to cancer extension; however, erosion through the posterior bony canal provides access to the mastoid cavity. Tumor growth medially along the EAC can extend through the tympanic membrane and bony tympanic ring, allowing invasion into the middle ear. Once a tumor enters the middle ear, the hard bone of the otic capsule provides a more effective barrier against tumor spread. In the middle ear or mastoid, tumors spread easily via the eustachian tube, round and oval windows, neurovascular structures, and extensive air spaces of the mastoid cavity. The eustachian tube and neurovascular structures of the middle ear are potential means of tumor spread beyond the temporal bone to the infratemporal fossa, nasopharynx, or neck. Nodal metastasis is uncommon in early disease but may occur in 10-20% of cases of advanced disease. [9, 4] The lymphatic drainage of the auricle and EAC extends anteriorly to the periparotid lymph nodes and parotid gland. Drainage may also occur to the jugular chain or nodes overlying the mastoid. Lymphatic drainage of the medial EAC and middle ear is to the retropharyngeal nodes or deep jugular nodes. The lymphatic drainage of the inner ear is unknown. Physical examination in cases of temporal bone cancer should include inspection of the pinna, EAC, and middle ear for ulcers, mass lesions, soft tissue swelling or induration, old scars (eg, previously excised skin cancers may have been forgotten by the patient), and otorrhea. Perform a thorough CN examination. Close inspection for facial weakness is crucial. Perform audiography if hearing loss is suspected. As always, perform a complete head and neck examination. The patient's general medical condition should also be evaluated because it may greatly impact treatment options and outcome. In general, all patients who are medically able should undergo surgical treatment. Primary radiation is ineffective for curative treatment; however, in the most extreme cases in which contraindications to surgery are serious deterrents to surgery, palliative radiation and chemotherapy may be offered. The temporal bone is a complex structure comprised of 3 parts: the squamous, tympanic, and petrous portions. The squamous portion of the temporal bone forms a small portion of the bony EAC, the zygomatic process (and mandibular fossa), and a portion of the mastoid process. It has a superior portion that protects the temporal lobe and articulates with the parietal and occipital bones. The tympanic portion forms most of the bony canal and the posterior wall of the mandibular fossa. The middle ear is a space between the squamous and temporal portions laterally and the petrous portion medially. The petrous portion of the temporal bone contains the otic capsule and the internal auditory canal. The EAC extends from the concha to the tympanic membrane. The lateral cartilaginous portion meets the bony portion at a bony-cartilaginous junction located about one third of its total length from the lateral aspect. The anterior cartilaginous wall contains small cartilage defects filled with connective tissue called fissures of Santorini, which are direct routes of tumor spread into the periparotid tissues. Within the bony portion is another potential route for tumor extension at the foramen of Huschke, a defect of the tympanic ring located inferiorly. The anterior wall of the canal is closely associated with the temporomandibular joint, and the anterior-inferior wall is close to the parotid gland. The temporal bone contains or abuts many vital structures, including the internal carotid artery, jugular bulb, cavernous sinus, and sigmoid sinus. A thin layer of bone separates the middle ear and mastoid cavities from the middle and posterior fossae dura. Other important structures that lie within the temporal bone include the ossicles, the cochlea, and the eustachian tube and the cochlear, vestibular, facial, trigeminal, caroticotympanic, chorda tympani, and petrosal nerves. In general, no contraindications specific to tumors of the temporal bone exist; all patients who are medically able should undergo surgical treatment. However, advanced tumors with intracranial invasion have a grave prognosis, and treatment should probably be limited to palliation with less extensive (and less morbid) surgical procedures. Zanoletti E, Marioni G, Stritoni P, et al. Temporal bone squamous cell carcinoma: analyzing prognosis with univariate and multivariate models. Laryngoscope. 2014 May. 124 (5):1192-8. [Medline]. Breen JT, Roberts DB, Gidley PW. Basal cell carcinoma of the temporal bone and external auditory canal. Laryngoscope. 2018 Jun. 128 (6):1425-30. [Medline]. Song K, Park KW, Heo JH, Song IC, Park YH, Choi JW. Clinical Characteristics of Temporal Bone Metastases. Clin Exp Otorhinolaryngol. 2018 Jun 19. [Medline]. [Full Text]. Moffat DA, Wagstaff SA, Hardy DG. The outcome of radical surgery and postoperative radiotherapy for squamous carcinoma of the temporal bone. Laryngoscope. 2005 Feb. 115(2):341-7. [Medline]. Keereweer S, Metselaar RM, Dammers R, Hardillo JA. Chronic serous otitis media as a manifestation of temporal meningioma. ORL J Otorhinolaryngol Relat Spec. 2011. 73(5):287-90. [Medline]. Jin YT, Tsai ST, Li C, Chang KC, Yan JJ, Chao WY, et al. Prevalence of human papillomavirus in middle ear carcinoma associated with chronic otitis media. Am J Pathol. 1997 Apr. 150(4):1327-33. [Medline]. Lim LH, Goh YH, Chan YM, Chong VF, Low WK. Malignancy of the temporal bone and external auditory canal. Otolaryngol Head Neck Surg. 2000 Jun. 122(6):882-6. [Medline]. Leonetti JP, Smith PG, Kletzker GR, Izquierdo R. Invasion patterns of advanced temporal bone malignancies. Am J Otol. 1996 May. 17(3):438-42. [Medline]. Moody SA, Hirsch BE, Myers EN. Squamous cell carcinoma of the external auditory canal: an evaluation of a staging system. Am J Otol. 2000 Jul. 21(4):582-8. [Medline]. Choi JY, Choi EC, Lee HK, Yoo JB, Kim SG, Lee WS. Mode of parotid involvement in external auditory canal carcinoma. J Laryngol Otol. 2003 Dec. 117(12):951-4. [Medline]. Arriaga M, Curtin H, Takahashi H, Hirsch BE, Kamerer DB. Staging proposal for external auditory meatus carcinoma based on preoperative clinical examination and computed tomography findings. Ann Otol Rhinol Laryngol. 1990 Sep. 99(9 Pt 1):714-21. [Medline]. Austin JR, Stewart KL, Fawzi N. Squamous cell carcinoma of the external auditory canal. Therapeutic prognosis based on a proposed staging system. Arch Otolaryngol Head Neck Surg. 1994 Nov. 120(11):1228-32. [Medline]. Zhang B, Tu G, Xu G, Tang P, Hu Y. Squamous cell carcinoma of temporal bone: reported on 33 patients. Head Neck. 1999 Aug. 21(5):461-6. [Medline]. Gillespie MB, Francis HW, Chee N, Eisele DW. Squamous cell carcinoma of the temporal bone: a radiographic-pathologic correlation. Arch Otolaryngol Head Neck Surg. 2001 Jul. 127(7):803-7. [Medline]. Gaudet JE, Walvekar RR, Arriaga MA, Dileo MD, Nuss DW, Pou AM, et al. Applicability of the pittsburgh staging system for advanced cutaneous malignancy of the temporal bone. Skull Base. 2010 Nov. 20(6):409-14. [Medline]. [Full Text]. Nyrop M, Grontved A. Cancer of the external auditory canal. Arch Otolaryngol Head Neck Surg. 2002 Jul. 128(7):834-7. [Medline]. Kunst H, Lavieille JP, Marres H. Squamous cell carcinoma of the temporal bone: results and management. Otol Neurotol. 2008 Jun. 29(4):549-52. [Medline]. Nakagawa T, Kumamoto Y, Natori Y, et al. Squamous cell carcinoma of the external auditory canal and middle ear: an operation combined with preoperative chemoradiotherapy and a free surgical margin. Otol Neurotol. 2006 Feb. 27(2):242-8; discussion 249. [Medline]. Pemberton LS, Swindell R, Sykes AJ. Primary radical radiotherapy for squamous cell carcinoma of the middle ear and external auditory cana--an historical series. Clin Oncol (R Coll Radiol). 2006 Jun. 18(5):390-4. [Medline]. Prasad SC, Mimoune HA, D'Orazio F, et al. The role of wait-and-scan and the efficacy of radiotherapy in the treatment of temporal bone paragangliomas. Otol Neurotol. 2014 Jun. 35(5):922-31. [Medline]. Matoba T, Hanai N, Suzuki H, et al. Treatment and Outcomes of Carcinoma of the External and Middle Ear: The Validity of En Bloc Resection for Advanced Tumor. Neurol Med Chir (Tokyo). 2018 Jan 15. 58 (1):32-8. [Medline]. [Full Text]. Hirsch BE, Chang CYJ. Carcinoma of the temporal bone. Myers EN, ed. Operative Otolaryngology Head and Neck Surgery. Philadelphia, Pa: WB Saunders; 1997. 1434-1458. Medina JE, Park AO, Neely JG, Britton BH. Lateral temporal bone resections. Am J Surg. 1990 Oct. 160(4):427-33. [Medline]. Morris LG, Mehra S, Shah JP, Bilsky MH, Selesnick SH, Kraus DH. Predictors of survival and recurrence after temporal bone resection for cancer. Head Neck. 2011 Sep 23. [Medline]. Nam GS, Moon IS, Kim JH, Kim SH, Choi JY, Son EJ. Prognostic Factors Affecting Surgical Outcomes in Squamous Cell Carcinoma of External Auditory Canal. Clin Exp Otorhinolaryngol. 2018 May 22. [Medline]. [Full Text]. Marioni G, Zanoletti E, Giacomelli L, Braggio L, Martini A, Mazzoni A. Clinical and pathological parameters prognostic for increased risk of recurrence after postoperative radiotherapy for temporal bone carcinoma. Head Neck. 2015 Sep 8. [Medline]. 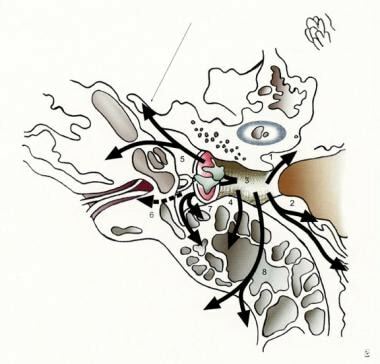 Coronal image that represents the following potential routes of spread of temporal bone cancer: 1) Anteriorly into the soft tissues of the temporomandibular joint and parotid through the fissures of Santorini. 2) Laterally via the soft tissue and cartilage of the external auditory canal to the concha and pinna. 3) Medially through the tympanic membrane to the middle ear, inner ear, and mastoid. 4) Posteriorly into the mastoid, epitympanum, and middle fossa. 5) Spread can continue through the Eustachian tube to the infratemporal fossa. 6) Spread through the round window, oval window, or facial nerve into the internal auditory canal and cerebellopontine angle. 7) Along the facial nerve through the mastoid and into the stylomastoid foramen and beyond. 8) Via the mastoid into posterior fossa 9) Along structures of the skull base, including the carotid, jugular bulb, and clivus. Axial T1 MRI with gadolinium of right T4 squamous cell carcinoma. Axial T1 precontrast image of the same patient from Image 3. Axial CT scan of the same patient from Image 3 with T4 squamous cell carcinoma. Axial CT scan of a patient with recurrent basil cell carcinoma of the pinna, spread to the left inferior temporal bone.